The 2013 BOS Earthwave Beach Festival will host attempts to set new Guinness World Records for the ‘most surfers riding the same wave’ and for ‘the longest touch rugby game’ when the sixth edition of this popular gathering of Cape Town’s beach community is run at Surfers Corner in Muizenberg on the weekend of 19 & 20 October. The festival will again harness the immense interest surrounding Guinness World Records to promote sustainable lifestyle choices by featuring a wide range of both competitive and fun events in the ocean, on the beach and in the Muizenberg Pavilion alongside exhibitions, demonstrations and talks on environmental issues over the two days. In addition to prizes for the nearly 1 000 participants, there is also plenty on offer for spectators with valuable give-aways, sticker-showers, beach cleanups, raffles and fund-raising for worthy causes. The awards ceremonies, exhibits and an after-party with live bands will be staged in the Pavilion at Surfers Corner. 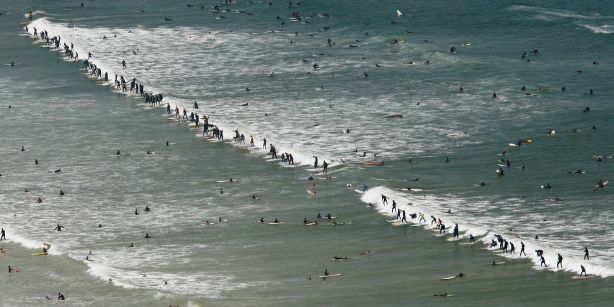 Despite attempts to break the Guinness World Record for the most surfers riding the same wave in California and Australia during the past year, the record still stands at 110 set in Muizenberg at Earthwave 2009. Earthwave Brazil, the 2008 record holder, will also be making another attempt to break the current record on Saturday 12 October 2013 at Quebra Mar near Sao Paulo. The record for the longest touch rugby game is 27 hours set in Australia in 2010 and the WP Touch Association will be attempting to break this marathon record at the festival by staging a match that runs from 8am on Saturday through the night until 12 noon on Sunday, a total of 28 hours! The Battle of the Bay presented by Xpression on the Beach will see standup paddlers racing from Muizenberg to Fish Hoek and back on Sunday with a series of epic short-courses races through the surf planned for the Saturday. Muizenberg, with its pristine beach, gentle rollers and warm water, is where the first photographic evidence of people riding waves in South Africa was recorded in 1919. Considered the birthplace of surfing in the country, it is rated one of the world’s top 20 beach towns by National Geographic. Further information on the BOS Earthwave Beach Festival can be found at www.facebook.com/BOS.Earthwave and www.kahunasurf.co.za. The organisers can be contacted via kahunasurf@mweb.co.za for details on how to become part of this sustainable lifestyle initiative. • BOS is a range of organic rooibos ice teas blended with all-natural fruit flavours – peach, lemon, apple, berry, lime & ginger and cranberry energy. It is preservative, colourant and caffeine free. • The BOS packaging is bold, colourful, and graphic exuding a youthful and open spirit. • BOS premium quality organic rooibos is farmed exclusively at Klipopmekaar rooibos farm and private nature reserve. At the vanguard of organic and ethical farming, Klipopmekaar’s approach is intrinsic to the BOS experience. • BOS plants and maintains 1 tree for every 2000 cans or packs sold. We focus this initiative in under-privileged and under-greened schools and public spaces. • BOS likes to engage, have fun, give joyful experiences and share a sense of life and living. A once in a lifetime gathering of 1960’s surfers and other beachgoers who frequented the iconic Surfer’s Corner at Muizenberg Beach will celebrate their memories in Cape Town this weekend, starting with a party at the Pavilion on Friday night and continuing with barbeques on Saturday and a get together on the beach at the Corner on Sunday. More than 520 guests, many of whom have travelled from overseas or elsewhere in the country specifically for the event, will be packed into the Friday night shindig that will feature live music from the era, a tribute to the late John Whitmore, the Doyen of Cape Town and South African surfing, a huge raffle with sponsored prizes totaling tens of thousands of Rands, a giant custom-made backdrop of the Corner bathing boxes for group photographs, aptly named dishes on the food menu and a wide choice of discounted refreshments.. Patrons will also be treated to a video presentation of original footage and interviews with storytellers from ‘back in the day’ along with a slide show of archive images compiled by Carlos Feyder. Footage recorded at the event will be added to the compilation which then will be available for general distribution. Images from the function can also be downloaded from www.surfpix.co.za after the event. Initiated and coordinated by veteran surfing administrators Nick Hough and Charlie Moir, the project was intended to get around 100 of their old surfing buddies together but has resulted in undeniably the biggest ever gathering of Cape Town’s surfing pioneers and arguably the largest assembly of 1960’s surfers anywhere. Hough, Moir and the rest of the organising committee are hopefully that the occasion will leave a lasting legacy for Cape Town surfing with plans for a Surfing Museum and a Surfing Walk of Fame at the corner being hatched. The gathering will also commemorate a centenary of surfing at Muizenberg as according to the recently published book “Muizenberg – a forgotten story” by Mike Walker, the official history of the coastal town, people started surfing there in 1910 and there is photographic evidence of stand up surfers riding waves during WW1. There will be reunions within the overall reunion as members of the surf clubs of the day such as Muizenberg Corner, Atlantic, Point and their elite offshoots Surf Club Da Cat and Surf Club Swamis get together with their old-time friends. The project culminates in a gathering of everyone on location at the Corner on Sunday at 10am when a dozen or so original 1960’s surfboards will be available for the attendees to test their skills on in the gentle rollers. Further information on the event can be found at the Facebook group ‘Surfers Corner Sixties Reunion’ where hundreds of archive images are displayed alongside discussion threads and messages from former Surfers Corner beachgoers. Please Note: For media enquiries, please contact Paul Botha via the details above. The simple query “When are you gonna get the guys together?” by 1960’s Muizenberg surfing stalwart Henk ‘Farmer’ Schagen has triggered a sequence of events that will culminate in over 500 people from every corner of the globe re-uniting in Cape Town in March to celebrate their memories of the time they spent at the iconic ‘Surfers Corner’ between four and five decades ago. The question, posed to Charlie Moir in late 2009, led the longboard surfing veteran to consult with good friend and former surfing administrator Nick Hough. The pair who resurrected local longboard surfing in the mid 1980’s by forming the Western Province Longboard Club decided to start making enquiries about the whereabouts of their 1960’s peers. Their quest immediately drew positive feedback from everyone approached and within weeks there were nearly 100 names on the list of Sixties surfers, lifesavers, girls, beach bums, musicians and others who were keen to meet and reminisce about the magical era as the so-called ‘baby-boomers’ started to come of age. Thanks to modern communications facilities, word of the reunion soon spread throughout the Muizenberg diaspora and enquiries started flooding in from all corners of the country and the planet. 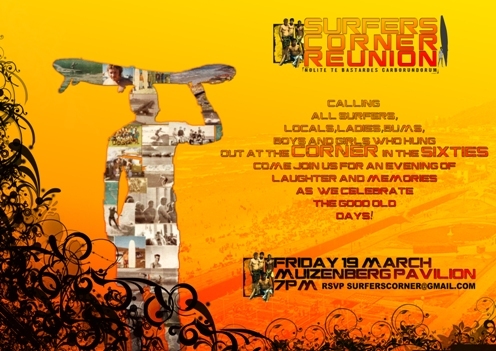 With a month to go before the official Surfers Corner Sixties Reunion at Muizenberg on March 19, there are already 500 confirmed attendees and organisers have stopped taking more. “It’s unbelievable how the project has grown,” says Moir whose portfolio includes what he calls the ‘nuts and bolts’ of the event, ensuring that the ticketing, staffing, decorations, catering, entertainment and other aspects of the reunion function are in place. Hough, who has worked tirelessly in handling the communications and guest list, gathering archive materials and trying to raise sponsorship so everyone can attend the event at no cost, is equally amazed at the response the reunion has generated. Arguably the most beneficial aspect of the event has been the rekindling of friendships from decades ago made possible via the contact list containing well over 300 interested parties compiled by the organisers. People who spent their formative years hanging out on the beach at Surfers Corner but who have not seen or heard from each other for decades are now back in touch and communicating. A video presentation featuring archive footage and images, interviews with personalities from the ‘60’s and music from the period is being produced by Carlos Feyder to be shown at the event. Tentatively titled ‘Surfers Corner – The Movie’ with a sub-title of ‘Should have been here yesterday’, the trailer for the movie can be found at http://www.vimeo.com/9373680 Additional material recorded at the function will be included in the finished production which will be available to all participants after the event. The dress code for the function is ‘casual, with a hint of Hawaiian’ and the organisers foresee the men wearing floral shirts while women can wear leis and flowers in their hair. Patrons will be seated according to their original home base or surf club affiliation during the sixties and designated areas will house those from Deep South, Southern Suburbs and Atlantic Seaboard which produced clubs like the Muizenberg Corner, Point and Atlantic and their elite offshoots such as Surf Club Swamis and Surf Club Da Cat. The function gets underway at 7pm and a massive group photo is planned for 7.30 with the image rushed off for processing and printing before being inserted in a frame and a copy presented to all participants before they leave that evening, along with a copy of the poster specially designed for the event. After the welcome by the organisers, a special toast will be made to the late John Whitmore, the Doyen of South African surfing and an icon of the sixties surfing lifestyle. The tribute, to include ‘absent friends’, will be led by Claus ‘Bosco’ Andrup who is traveling from Canada specifically to attend the event. A cash bar, run as a fund-raiser by the Western Province Longboard Club, along with a choice of convenient foods will be available at the venue while the entertainment for the evening includes original sixties music performed by a band that includes Paul de Villiers, Jimmy Moffatt, Clive Maasch and others, with harmonies from the Surfing Sixties Sisters. A raffle featuring dozens prizes ranging from a Firewire longboard through apparel from multinational brands to numerous alcohol products, accommodation vouchers, surfing equipment and many, many more will ensure that virtually everyone who attends will take something home. Further details on the event can be found on the Facebook group Surfers Corner Sixties Reunion where there are well over a hundred old time images, many threads of friends connecting and more than 250 members.